They are four of the most beautiful words in the language: “Pitchers and Catchers Report.” What do those four simple words mean to you? I will be writing an MLB.com story about those words in the next few days as we count down to #BaseballBegins on Wednesday, Feb. 18, and I would like to include some fans within the responses — mixed with pitchers, catchers, managers, legends, execs, broadcasters, groundskeepers, a Grapefruit League city mayor and more. Please leave your response in the comments here. Include your first and last name, hometown and favorite team. And if you blog about the subject yourself, either here at MLB.com/blogs or elsewhere, please be sure to leave a Permalink URL in the comments so we can get people there. Here’s to that incredible time of year for all of us and another big Baseball season! Hope you guys are having as good a day as I am. This is one of my favorite times, when the first actual games are played between Major League teams for the first time since the World Series. As I wrote yesterday on MLB.com, we have launched our MLB.com At Bat 13 app, so we’re back for a fifth year with the best sports app ever and forever. I’m enjoying a Gameday Audio marathon, making too big a deal about Freddie Freeman registering the first hit of 2013, Tigers breaking their four-game skid vs. MLB opposition, Terry Francona’s new-look Indians overcoming a quick five-run deficit, etc. It just feels good to hear that crack of the bat and to let yourself settle into the flow of a baseball game, instead of just talking about it. Did you know it’s the earliest the KC Royals ever played a first game? So while I am listening and readying for our first MLB.TV live games this weekend, I thought it would be a good time to surface the most recently updated MLB.com Blogs and give you a look at some bloggers who may be familiar or brand-new to you. In addition to this list below, be sure to get acquainted with our PRO Blogs roster. I appreciate all your recent comments here, and please keep it up, always adding your blog’s full URL so others can easily find you. We’ll be relaunching http://MLB.com/blogs in the near future, TBA. Just looking out the window and waiting for Spring Training. You? Everyone is buzzing about the Brothers Upton in Atlanta, an acquisition reported by Mark Bowman. What did you think of the Atlanta-Arizona trade? The Cutoff Man, MiLB.com PROSPECTive, Dugout Ponderings, The Unbiased MLB Fan, Brave Fan in Illinois and The Baseball Haven give you their takes. Fresh posts are in at Dodgers History, The Brewer Nation, The Rays Rant, MLB Urban Youth Academy, Balls and Strikes, SF Giants Photos, My Serendipitous Life as a Baseball Wife, Minoring in Baseball, Hillsboro Hops, Ben’s Biz Blog and The AustralianBaseballDigest. Blogger Terry Nelson says on Balls and Strikes that he is “not a winter person.” I agree with you, Terry. For full disclosure, this blogger is wearing warm Cardinals pajamas under his work clothes as this will probably be the coldest night of the year in New York City and I am headed over to Joe Torre’s Safe at Home event tonight at Chelsea Piers, to fire questions at guys like Brian Cashman, Gerry Cooney (! ), Hideki Matsui, Tony La Russa, Goose Gossage, Jorge Posada, Tom Coughlin and more. I believe this is the last in a long string of offseason dinners I cover for MLB.com during that wait between World Series clincher and pitchers and catchers reporting. The most recent dinner story I wrote was the most-shared MLB.com story on Facebook: Yogi Berra’s tribute night at the Baseball Assistance Team’s 24th annual Go to Bat for B.A.T. Fundraiser Dinner. We have since posted the clip of Yogi’s 65-word love letter to his lifelong sport, so I encourage you to embed it on your own blog and share it widely. Hopefully you already know that you can show MLB.com videos. It’s a great addition to your blog. Just click the gray Embed button on just about any of our videos. (Game footage video has a time delay for embed availability during the season.) Please leave comments here whenever you include MLB.com video embeds within your posts, as I would like to highlight that capability within our community here. We just introduced mlbpipeline.com — the go-to place for all prospect tracking and Draft analysis year-round, whether you’re looking for your organization’s pipeline talent or prospecting for your Fantasy roster. MLB.com senior writer Jonathan Mayo is our longtime prospect and Draft expert at MLB.com, and in addition to anchoring that, he is posting regularly at B3 – Big, Bald and Beautiful. Game times for this season were announced today. Where Everyone’s a Giant posted about it, good topic for you to blog about. My MLB.com colleague Jesse Sanchez recently posted a great entry about late author Richard Ben Cramer and how he influenced him. Remember to post your Top 100 banner if you made our 2012 list like Wrigley Regular. Just had one of those moments at spectacular Salt River Fields that you have to share with other baseball fans. It’s almost time for the first games between Major League teams. We are ready. We just launched the MLB.com At Bat app today, so make sure you download and read my MLB.com story to understand some of the new options and subtle changes. Please take the time to read “My Baseball story” by Matt at The Cardinals’ Base, and share your own favorite Major League Baseball memory in the comments there and on your own MLB.com Blog. After all, that’s why we are all blogging here and ready for another great MLB season. [updated] As of 5:22 pm ET, Plushdamentals was third overall in page views at MLB.com for Feb. 24, as people are buzzing over 16-year-old Brewers blogger Curt Hogg, who broke news. No. 1 is MLB.com Braves beat reporter Mark Bowman and No. 2 is From the Corner of Edgar & Dave. We’ll have the next monthly MLB.com Blogs Latest Leaders up next week, so never too late to make sure you are doing all the right things to promote your own blog. Be sure to comment on as many other MLB.com Blogs as you can and always leave your full URL wherever you go. Will Plushdamentals have enough time to rise to the top of the Fan category? 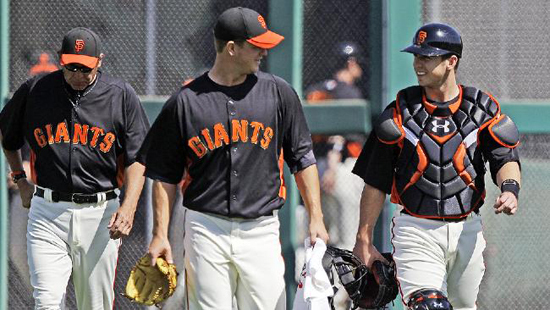 Who’s going to be at Spring Training and who’s going to be blogging about it? Let us know here so we can keep an eye out for new posts and hopefully help with some promotion. I’ll be in Arizona next week with the MLB Fan Cave panel and 30 finalists so holla. Speaking of Fan Cave, in case you missed it, our friend Erik at Counting Baseballs took the time to critique all 50 of the Fan Cave finalist videos when that voting began. He came up with his own top 10, so you can crosscheck and see whether they advanced. Jim Kaat’s first Spring Training with the Washington Senators was in the 1950s. 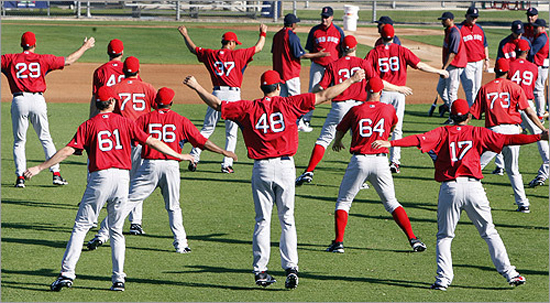 We’re happy to say that Kitty Kaat is going strong and this week posted a new entry about 2012 Spring Training – where he is helping the Red Sox pitching coach at Fort Myers. Please leave Jim some comments. Calling fans of the defending World Champs: Got a question? Leave it on Jen Langosch’s blog By Gosh, It’s Langosch, because in addition to all of her coverage on cardinals.com, she is doing a Question of the Day on her blog from Cardinals camp. Question, Jen – how do you find time to do such a great job on your MLB.com Blog? Welcome back to Redsox Nation and Pittsburgh Peas – keep it going! With all due respect to those other games, The World Will Be Watching THIS on March 23. And I even read all three books. Why do you blog? Tell us. Make sure you use the social media widgets in the WordPress.com dashboard and use Twitter and Facebook to support your latest MLB.com Blogs posts. You should create your own Facebook Page to match your blog and encourage others to Like your FB page. Those are no-brainers for promo and we make it very easy to incorporate all that here. A good example is the author of gojays. And a nice job using polls as well. Keep leaving comments here with your blog’s full URL so we can help people find you. Happy Spring Training. Post of the week on MLBlogs…. Happy Spring Training! I will be updating my annual IT’S HERE story on the MLB.com and club homepages through the first days of reporting, and it has been a blast to read all your posts about the first day of spring — like this one from Kaybee. Kind of sad that even on this special day we seem obligated to consecutively type the first, 18th, 15th and fourth letters of the alphabet…. Sorry for the side panel outage tonight, folks. Have heard from a lot of you about a minor coding snafu and it has been resolved. Side panels are all reporting here for Spring Training now, and thanks for your patience…. There’s a bit of confusion about the process of obtaining permission to comment on a blog. The way to do this is to log in to your MLB.com account from the blog on which you wish to become a commenter. You’ll only need to do this once for that blog, then you have comment permissions. Note that if you’re already logged in and go to a blog to which you have not yet received permission to comment, you’ll see a message indicating you don’t have permission to comment if you attempt to do so. The solution in this case is to log out, then go log in via that blog, and you’ll be all set going forward as far as commenting on that specific blog…. All but a few of the 30 MLB.com beat writer blogs are now populated as of this writing. The links are in my previous post. Please drop in on them with comments, as our crew is now settled in or on the way to Arizona/Florida and would love to hear from you. We have indexed all the writers in the PRO BLOGS drop-down on the MLBlogs.com homepage, and here’s another great way to find all of them at once: See the new MLBlog of Jen Langosch, our Pirates beat writer at MLB.com. Thanks, Jen…. Really looking to our friend Alyssa Milano’s new book coming out next month. Alyssa just posted again to her touch ’em all MLBlog this week, as she is about to start her third year of MLBlogging and I think eighth year as a Dodgers season ticket holder…. Join us on the Official MLBlogs Twitter or follow @mlblogs over there. Welcome to the MLB.com/blogs community blog! Find other fans, post comments & questions, get tips and discover your new favorite blog at the big-league home for baseball bloggers!